Known as Boise’s Backyard Playground, Garden Valley, Idaho is home to majestic mountain peaks soaring 7,000 feet above the horizon along with a beautiful valley of meadows, wildlife and more. Garden Valley is a small town surrounded by nature’s peaceful, serene beauty. This summer, Garden Valley is the place to be if you’re the kind of person who loves the outdoors. With trails covering almost 5,000 miles—yes, that’s right, 5,000—you can go hiking, biking, backpacking, camping, and even horseback riding, surrounded by nature. If you’re tired of “the city life,” Garden Valley is the kind of place to get-a-way from it all. Do you like to spend time on the water? The Middle Fork of the Payette River is a great place for swimming, tubing, canoeing or kayaking. Garden Valley is also quite well-known for its hot springs—nature’s Jacuzzi. If and when you’ve seen enough wild animals and had enough peace and tranquility, then head to the lively Starlight Musical Theater with its outdoor amphitheater seating. Shows include Seven Brides for Seven Brothers (thru 8/2); Footloose (thru 8/9); The Sound of Music (7/12-8/15); Big River-Huck Finn (8/16-9/13); and Cross the Line (8/25-8/28). Prices are thankfully affordable at the Starlight. Need a place to stay in Garden Valley? 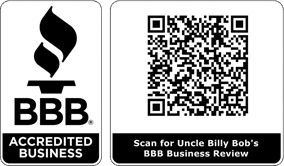 Uncle Billy Bob’s has clean cabins, “wacky tacky” redneck trailers, and room for your RV. The folks at Uncle Billy Bob’s can hook you up with area trail rides, white water rafting (Class III/IV), kayak lessons, zip line tours, and the “Silver Creek Plunge Adventure.” Call 208-462-5BOB to find out what that is— and/or to make your reservations.